“There’s a Peruvian guy named Jonathan Day with a bakery in Lima called El Pan de la Chola. 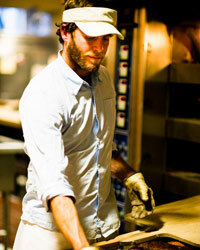 He invited me to come and surf and bake bread with him,” says bread artisan Chad Robertson of Tartine Bakery in San Francisco. Here, Robertson shares his ultimate bakery bucket list from Lima to a spectacular Stockholm destination where the cardamom buns are incredible. They use exceptional Nordic wheats, all certified organic, all grown just outside of Copenhagen. 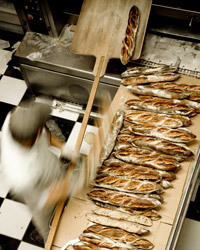 They bake on the same schedule that we do at Tartine, in small batches, so their stuff is fresh and delicious. And Claus Meyer has built a really varied food empire—he’s the cofounder of Noma—so all the jams that they use, a lot of the base ingredients, are also produced by his organization. And then, honestly, Danish butter is amazing. So is Swedish butter—nicely cultured and super-yellow. There’s an excellent bakery called Valhalla, or Valhallabageriet. They make beautiful breads and pastries. The cardamom bun is like the morning pastry of Sweden. It’s made with sweet dough flavored with so much fresh ground cardamom, it’s incredible. It’s also got butter and cream, but they grind the cardamom fresh so it’s super-fragrant. It looks like it should be too much—it looks like someone cracked pepper over it, but it’s so delicious. They sell a particularly good one. And their coffee is just perfect. Just from looking at their bread on their website I can tell right away they’re doing good bread. Using a wood-fired oven, a lot of it made with grains they’re growing right there. That’s a place I want to visit. There’s a Peruvian guy named Jonathan Day with a bakery in Lima called El Pan de la Chola. He invited me to come and surf and bake bread with him. He’s got a wood-fired oven and makes really good bread using natural levain and long rise with a lot of freshly ground flour. They also make coffee and hot pressed sandwiches, it’s pretty cool. He was just baking on the beach and surfing, then he got this space, and asked me what I thought he should do with it. I said, just make really good bread, and sell hot bread and pressed sandwiches. And if you want to kick it up at night, make pizza out of that same oven. And he kind of did that and it’s really doing well. There’s another young guy in Rome named Gabriele Bonci who’s breaking all the rules for pizza, using different flours and an all-natural levain.